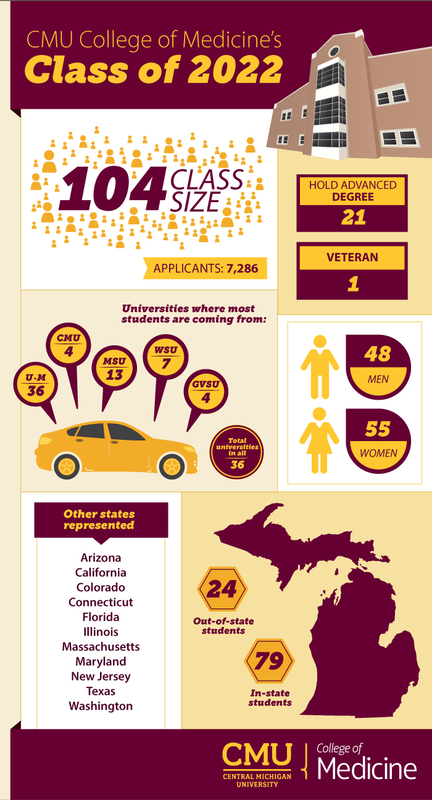 Central Michigan University’s College of Medicine Welcomes Class of 2022! As the members of Central Michigan University’s College of Medicine Class of 2022 slipped on their white coats for the first time on Aug. 3, they became united in spirit with more than 550 former first-year students in embracing the college’s mission to serve the underserved. The annual ceremony that marks the beginning of a student’s journey into practicing medicine comes at an important time for the Central Michigan University college, said Dean George Kikano in his remarks to the new students gathered at Plachta Auditorium in Warriner Hall. He said it is a time when the college’s undergraduate and graduate medical education programs are continuing to innovate and grow; when the college recently received full accreditation from the Liaison Committee for Medical Education; and when 100 percent of its graduates have placed in residencies — 10 students in CMU’s residency program in Saginaw, 54 percent in Michigan and 75 percent in primary care. “Now, more than ever, we are delivering on our mission to train, to treat and to lead in fulfilling our mission and improve the future of health care in Michigan,” he said…..